Each session starts in the evening of the first day and ends after lunch on the last day. Only the sessions at Acuto end after dinner on the last day. July 2nd is for optional group tour. 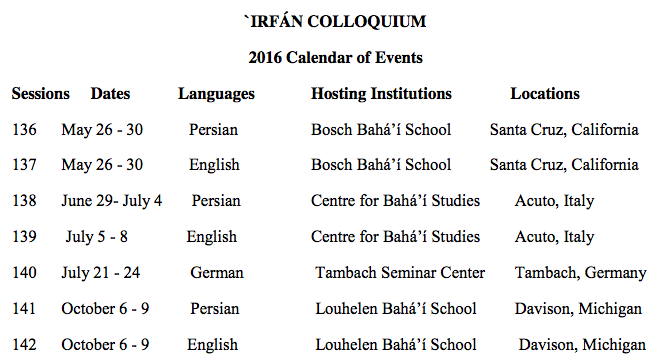 The annual sessions of the ‘Irfán Colloquium in 2016 will be held in English and Persian at Bosch Bahá'í School in Northern California, Louhelen Bahá'í School in Michigan, and Center for Bahá'í Studies in Acuto, Italy. The `Irfán Colloquium aims at promoting deeper and systematic studies in the scriptures of the world's religions from the Bahá'í perspective, as well as fundamental principles of the belief system and the sacred writings of the Bahá'í Faith, the interface between the Bahá’í Faith and various religious traditions and schools of thought. Participating at the ‘Irfán Colloquium provides an opportunity for dialogue, networking and team-building among those engaged in Bahá’í studies. It is also a unique occasion for all those attending these gatherings to meet and associate with researchers and scholars and benefit from their presentations. The presentation of research papers on topics related to the aims and objectives of the 'Irfán Colloquium is welcome. `Irfan Colloquium, in 2016, celebrates the Centenary of the issuance of the Tablets of Divine Plan and welcomes research papers related to those Tablets and their role and function during the unfoldment of the Formative Age of the Bahá’í faith. Kindly send, before 15 December 2015, the topic and abstract of your paper, and indicate the specific session or sessions of the `Irfán Colloquium in 2016 at which you would like to participate, in order to be considered for inclusion in relevant programs for that year.